Senior guard Vasa Pusica sizes up a Hofstra defender Saturday. It may have been Hofstra’s standout guard Justin Wright-Foreman that drew the attention of national media members and even Boston Celtics general manager Danny Ainge on Saturday night, but Vasa Pusica and his fellow Huskies commanded the spotlight as they earned a decisive 75-61 victory, ending Hofstra’s nation-best 16-game win streak. Northeastern (13-9, 7-3 CAA) lost a heartbreaker when they first encountered Hofstra (19-4, 9-1), falling to a buzzer-beating shot from Wright-Foreman, and the much-anticipated rematch lived up to the hype from the very start. Junior guard Donnell Gresham Jr. started things off for the Huskies with a 3-pointer on the game’s first possession, and Wright-Foreman looked to be attacking early on the other end. The lead changed ten times in the first half, with most of the back-and-forth coming in the opening minutes. Though Northeastern was without starter and defensive stalwart Shawn Occeus, Hofstra was looking to curtail the lethal 3-point shooting for which the 2018-19 Huskies have become known for. The Pride opened in a 2-3 zone on the defensive side, designed to limit on-ball penetration and likewise limit open looks for Northeastern’s shooters on the perimeter. The strategy seemed to work early on, but senior guard Vasa Pusica found some success getting to the rim thanks to his quick first step and composed finishing around the hoop. Hofstra boasts a conference-best offense to go with its conference-best record, but it looked like a different team against a Northeastern side that was missing its best defensive player in Occeus. It was Gresham who drew the mighty challenge of slowing down Wright-Foreman, who came into the game third in the nation in scoring with 26.0 points per game. Sophomore guard Myles Franklin was also asked to step up and shadow the electric guard once the starters began getting into foul trouble. 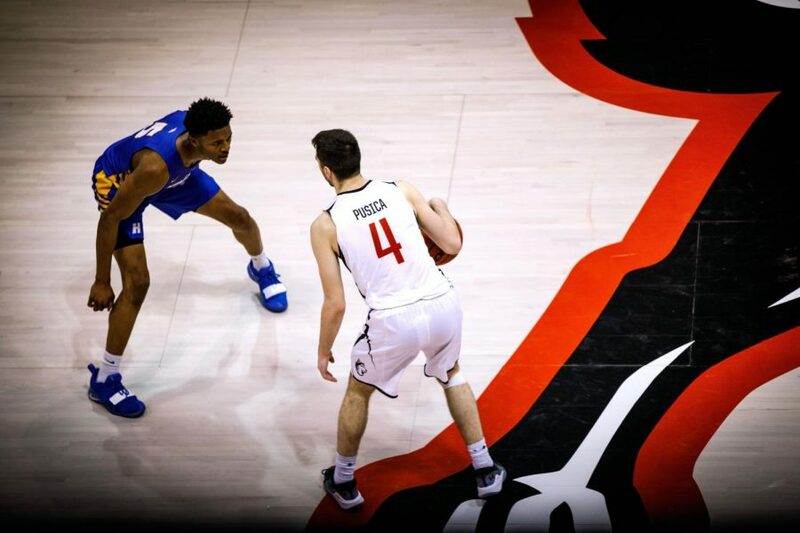 The committee approach was successful in the first half, as Wright-Foreman was limited to 8 points on 2-4 shooting before picking up his second personal foul early, and sitting out the final eight minutes of the period. Neither team was able to separate for most of the first half, and Northeastern only held a one-point lead with just under three minutes remaining. The Huskies then broke off a 7-0 run to close out the period, and took a 37-29 lead into the break. Pusica continued to attack the paint in the second half, but senior center and defensive anchor Anthony Green was forced to sit early when he picked up his fourth personal foul. Northeastern responded with even more intensity on the defensive end, forcing three consecutive steals and riding transition offense to the first double-digit lead of the game at 43-32, courtesy of a layup from Gresham with 15:33 remaining. Though Hofstra’s offense is a threat than can ignite at any moment, the Huskies managed to fend off any potential runs for the remainder of the game. Junior guard Bolden Brace drew a hard foul with 6:21 remaining, and an added technical foul on Hofstra allowed Northeastern to extend the lead to 16, all but wrapping up the game. Junior guard Jordan Roland jumped the passing lane for a crafty steal on Hofstra’s final possession and Northeastern walked away with the win, 75-61. Pusica was once again the star performer for the Huskies, racking up 24 points on an efficient 7-12 shooting to go with eight rebounds. In addition to a stellar performance defensively, Gresham also added 18 points on 5-12 shooting and five rebounds. Wright-Foreman looked explosive and dangerous whenever he was on the floor, but seemed to lack the finish that allowed him to put up 42 points against the Huskies last time out. He finished the game with 15 on 5-14 shooting. Northeastern improved to 13-9 on the year, and the 7-3 conference record is good for second in the CAA, now two games back from Hofstra. Hofstra fell to 19-4 (9-1 CAA) with the loss. The Huskies will now face William & Mary on Thursday at Matthews Arena.